Demo droid is useless. Has anyone found even a decent use for it? At least the camel will diffuse traps...only negative is that it is 25 spots (make it 8 and I would use it). Boog wrote: I actually prefer the long research times. The worst part of the events for me is the beginning, with all the short research times. I'd rather have more longer research breaks and fewer overall tasks. Exactly: once you get to the 8hr slots everything goes at nice and relaxed pace ... do 3 attacks, pop one in the oven and you have time again for useful stuff for 8 hrs. Start one in the evening and you really use that nightly down time efficiently ... while doing absolutely zilch. And because I don't have the time to get anything less than 100% attacks at short turnaround times they have to be mostly dev bases ... trying to see how few units you can use. Very boring. Only doing it for the bonus frags. Don't ask me why. Oh well: also got the LIN mech to lvl 5 or so ... be afraid rebels!!! NOTICE: Explosive Finish Game Samples still available for rest of day in Daily Crates. I can only assume that math is not your strong suit. 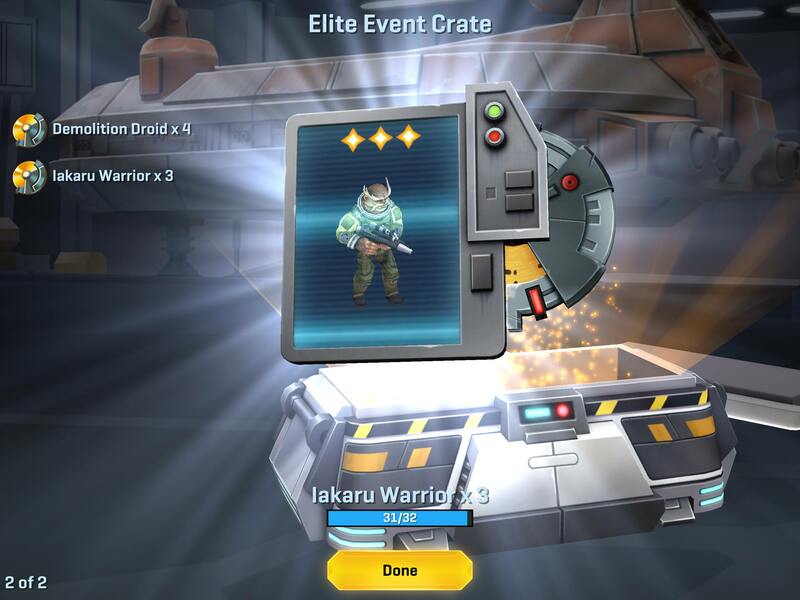 On one account I got the favorable test where I deploy troops (great use for the hoards of inventory on hand) and get an instant crate. In this case I am on my third bonus crate. On another account I got the unfavorable test for a high EP and 4 hour build. Since I do not have 8 free hours a day to focus on SWC I am only on the third objective on that account. It really is amazing that the developers would do this. Ah, I didn’t realize the crates were instant for the deployment objectives - I thought it was just comparing deploying a couple loads of units vs winning a couple battles worth of EP.